During the first quarter of this year, there were foreclosure filings on 1,948 properties in the St. Louis MSA, which equates to 1 foreclosure filing for every 51 housing units, according to the latest data from ATTOM Data Research. As the table below, which shows data for the 20-largest metro areas in the U.S., shows, this foreclosure rate puts St Louis at number 7 on the list in terms of foreclosure rate. Home sales in St Louis are on a slower pace than this time last year. The St Louis real estate market is still performing well, but just not at the same sales rate as last year thus far. Find out more, as well as get information on some of St Louis’s best resources for home buyers and sellers in our just-released market update video.In our MORE, REALTORS, 5 Minute St Louis Real Estate Market Update video below, you can quickly and easily get the latest information on home prices, home sales, trends and more for the entire St Louis area! Thinking of selling and want to know if your neighborhood is a seller's market? Contact us and we'll answer that question for you. While over the past few years we have seen a strong real estate market and easing mortgage loan guidelines, which is all good, unfortunately, mortgage fraud has been on the rise, according to a report just released by CoreLogic. According to their 2018 Mortgage Fraud Report, the CoreLogic® National Mortgage Application Fraud Risk Index was 151 for the fourth quarter of 2018, up 10% from a year ago when the index was 138. According to the report, Missouri was one of the top five states for increases in fraud risk for each of the past two years, moving from number 38 in the 2nd quarter of 2016 up to 15 for the 4th quarter of 2018. The top risk factor behind Missouri’s increased mortgage fraud risk was income fraud. 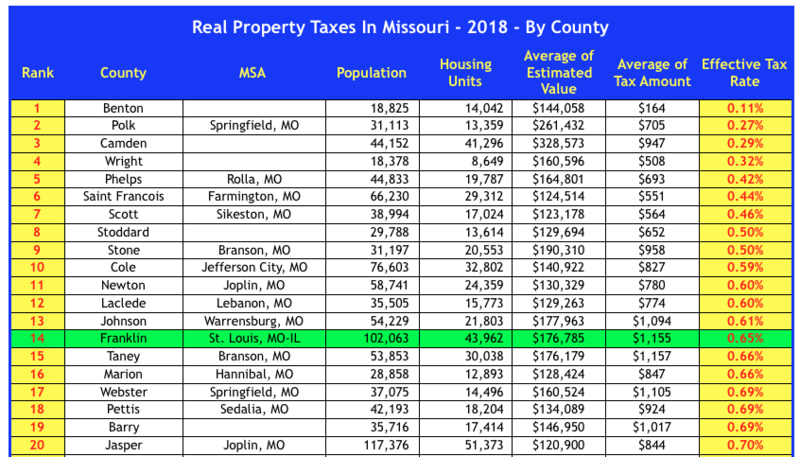 Yesterday, I wrote about Missouri having the 27th lowest effective property tax rate of the 50 states, so today I decided to look at property tax rates for the largest MSA’s around the country. 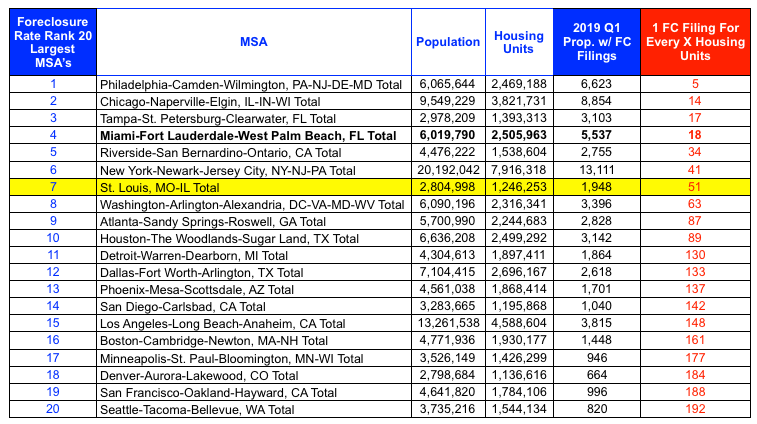 Included in my list are the 219 MSA’s with a population of 200,000 or more. As the table below shows, at the top of the list, with the lowest effective real property tax rate of the MSA’s is Laredo, Texas with an effective property tax rate of just 0.35%. The states of Alabama and Colorado both have 3 MSA’s on the list of the 10 MSA’s with the lowest property tax rate. To see how the three MSA’s in Missouri stack up, click here to see the entire list. Continue reading Which State Has the Lowest Property Tax Rates? 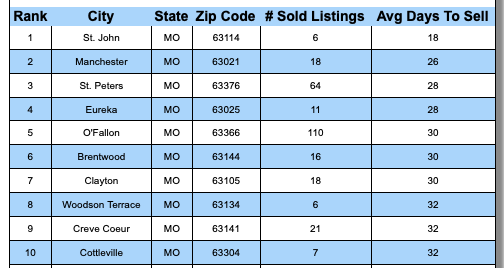 Homes that sold in St. John, Missouri within the past 30 days took an average of just 18 days to sell, putting St John in the number 1 slot of Fastest Sold cities in the St Louis MSA. As the table below shows, the cities that made the top 10 list are all on the Missouri side of the Mississippi, with 7 cities in St Louis County and 3 in St Charles County. If you are a homeowner thinking of selling and see your city on this list, now would be a really good time to consider listing your home for sale! 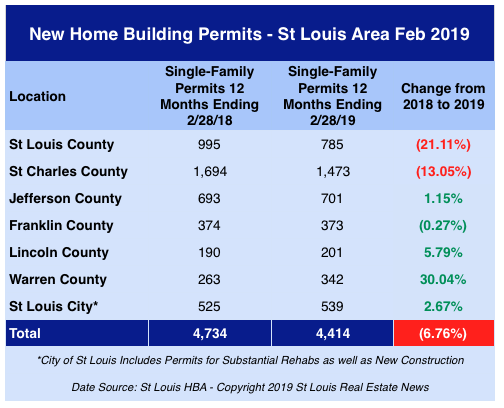 For the 12-month period ended February 28, 2019, there were building permits issued for 785 new homes in St Louis County, a decline of 21.11% from the prior 12-month period, according to the latest data from the St Louis HBA. As the table below shows, St Charles County saw a decline of 13.05% during the same period however the other counties reported on by the St Louis HBA are all showing increased new home building activity for the period. From a percentage standpoint, Warren County saw the biggest increase at 30.04%. Some new home buyers believe that if they buy a new home directly from the builder or the builder’s sales person, they will get a better price. But is this true? Do you get a better deal buying a new home directly from the builder? First, we should address a “better deal” and what constitutes a good “deal”. If it is strictly price, then, while I think it is somewhat short-sided on the part of the buyer and falls in that “penny-wise, dollar-foolish” category, in some instances, with some builders, the builder will save some cost by you buying from their agent. This is the result of the builder having an agent that will get paid less commission that the builder would pay a buyer’s agent then if the builder chooses to pass that savings along to the buyer, rather than keep it, the buyer should receive a better price. However, just like the possible savings motivated the buyer to deal directly with the builder, it is unrealistic to think that a builder is not going to feel the same and be motivated to have a better profit margin dealing directly with the buyer and instead would choose to forego the savings and give it to the buyer in the price. Plus, most builders appreciate and understand, the vital role a buyer’s agent plays in the transaction and wants to encourage agents to show and sell their homes, so they typically avoid doing things that look like they are trying to cut an agent out of a deal by dealing directly with the buyer. Continue reading Should you buy a new home directly from the builder? I saw an article recently about the results of a survey done of home sellers that found that nearly half of them didn’t realize they pay the buyers’ agent commission when they sell their home. While I don’t know for sure, I would guess that the people surveyed were homeowners that planned to sell their homes, rather than sellers that already had their homes listed for sale. I say this because the standard listing agreement used by St Louis REALTORS® spells out the total commission being charged the seller, as well as the portion of the commission that will be paid to the buyers’ agent which I would think, would cause the seller to realize they are paying commission to the buyers’ agent. While the seller, when presented with the listing agreement, could opt to not offer to pay commission to the buyer’s agent, the MLS rules require that all listings in the MLS (which is most of the St Louis home sales) include an “offer of compensation” for the buyers’ agent, which will come from the seller. Therefore, the sellers have to either offer to pay the buyer’s agent or forego having their listing in the MLS, hence why sellers pay the buyers agent in nearly all instances. It’s probably worth noting at this juncture that this practice has come under attack in a recent class-action lawsuit filed by Christopher Moehrl against The National Association of REALTORS®, Realogy Holdings Corp, HomeServices of America, Inc, Re/Max Holdings, Inc and Keller Williams Realty, Inc. The suit, which can be accessed using the link below, seeks to ban this type of commission arrangement. Continue reading Who Pays The Buyers Agent? Year to date, there have been 2,903 homes sold in the St Louis 5-County Core market, a decline of 3.6% from this time last year when 3,010 homes had sold. As the second chart below illustrates, the St Louis home sales trend (trailing 12 months and represented by the dark green line) peaked in October 2018 with 26,032 homes sold in the prior 12 months but then stalled and has begun a slight downward trend since with 25,756 homes sold in the 12 month period ending in February 2019. Meanwhile, St Louis home prices continue to rise with the median price of homes sold in the past 12 months in the 5-County Core market increasing 4.79% from the prior 12-month period. As the table below the charts shows, the median price of homes sold in the St Louis 5-County Core market during the most recent 12-month period was $197,000, up from $188,000 during the prior 12-month period. The inventory of homes for sale remains low, with just s 2.5 month supply of homes for sale in the St Louis 5-County Core Market. The St Louis real estate market is still doing well however, home sales are off to a slower start this year than last year. Find out more, as well as get information on some of St Louis’s best resources for home buyers and sellers in our just-released market update video. In our MORE, REALTORS, 5 Minute St Louis Real Estate Market Update video below, you can quickly and easily get the latest information on home prices, home sales, trends and more for the entire St Louis area! Since the announcement of the Better Together plans to merge the County and City of St Louis together into one big “Metro City”, there has been a lot of talk about the impact this would have on the St Louis real estate market. I’ve had several conversations with people in the real estate industry that feel St Charles County, as well as some of the other surrounding counties, will benefit if the Better Together plan succeeds. Their optimism is based upon the belief that, given what appears to be a tremendous groundswell of opposition to the plan from residents of both St Louis City and St Louis County, that, if it passes, many will flee the new Metro City. Obviously, only time will tell as to whether the Better Together Plan will even get the required number of signatures on the petition, if so, then whether the voters pass it. It is only then, in the subsequent months and years afterward that we will really be able to see just what impact, favorably or negatively, it has on the St Louis real estate market. For now, however, it seemed a good time to take a look at the St Charles County and St Louis County real estate markets and compare them. For the 12-month period ended February 28, 2019, there were 37,427 homes sold in the St Louis metro area, a decline of 1.22% from the prior 12-month period when there were 37,889 homes sold, according to our STL Market Report below. During the same period, the median price of homes sold in the St Louis metro area increased by 4.11% from $172,900 to $180,000. As the table shows, there is currently a 3.19 month supply of homes for sale in the St Louis metro area. The median rental vacancy rate for the St Louis metro area during 2018 was 6.8%, according to data recently released by the U.S. Census Bureau. This rate marks the lowest annual median rental vacancy rate for St Louis since the U.S. Census Bureau’s reports which began in 2005. 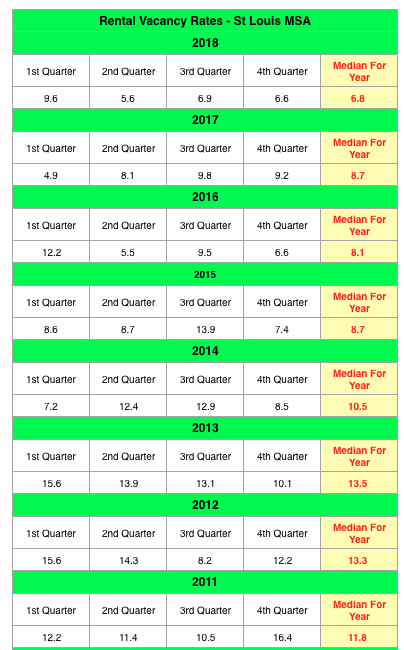 As the table below shows, the vacancy rate for the 4th quarter of 2018 was 6.6%, down from 6.9% the quarter before and down from 9.2% a year ago. During the 4th quarter of 2018, the homeownership rate for the St Louis MSA was 70.5%, the highest level since the 2nd quarter of 2015, according to data from the U.S. Census Bureau. 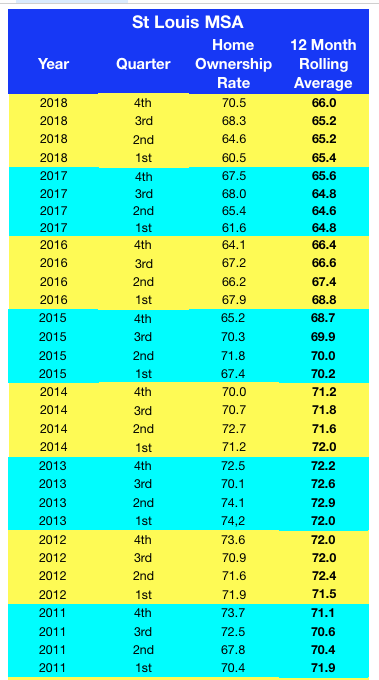 As the table below shows, the 12-month rolling average for the St Louis homeownership rate was 66.0% in the 4th quarter of 2018, the highest since the 4th quarter of 2016. 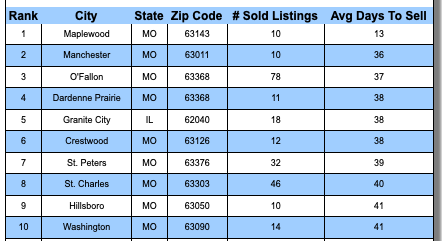 Homes that sold in Maplewood, Missouri and closed within the past 30 days took an average of just 13 days to sell, putting Maplewood in the number 1 slot of Fastest Sold cities in the St Louis MSA. As the table below shows, the cities that made the top 10 list are scattered throughout the area from Granite City, Illinois to Washington to Hillsboro as well as several places in between. There were 3,143 home “flips” in the St Louis metro area during 2018, according to data just released by ATTOM Data Research. With 7.4% of homes sold in St Louis being a flip in 2018, this is a decline of 3.7% from a year ago. The peak number of flips in St Louis came in 2005 when there were 4,426 homes flipped. What is meant by “flipped” home? ATTOM Data considers any home or condo that was sold during the third quarter of this year in an arms-length sale that had previously had an arms-length sale within the prior 12 months as well as a “flip”. Since homeowners don’t tend to buy a home only to turn around and resell it within a year, when this does occur it is typically the result of an investor buying a property, renovating it, then reselling it. 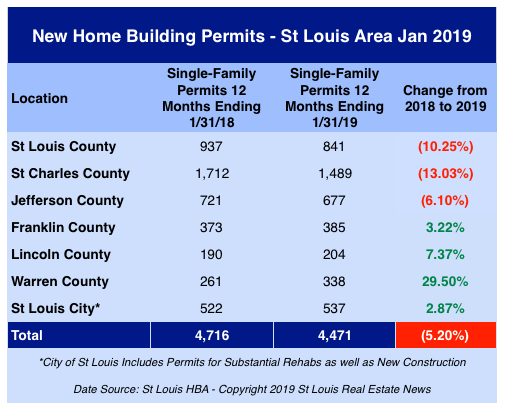 There were 4,471 building permits issued for new homes in the St Louis area during the 12-month period ended January 31, 2019, a decline of 5.20% from the prior 12-month period when there were 4,716 permits issued, according to information just released by the Home Builders Association of St Louis & Eastern Missouri (St Louis HBA). As the table below shows, St Charles County continues to see the largest decline in new home construction with 1,489 new home permits issued in the most recent 12-month period, down 13.03% from the prior 12 month period. Four counties in the St Louis area have seen gains in permits, with Warren County being the big winner in terms of percentage increase with nearly a 30 percent increase in new home permits for the period! Is The St Louis Housing Inventory Down 25 Percent Or Up 10 Percent? The Importance Of Understanding The Data. I promise not to turn this article into one of my boring, lengthy diatribes that only a data nerd could enjoy, however, I do want to discuss something that I think is very important for all home buyers, sellers and investors. Given that today there is a plethora of “data” and “information” available to us thanks, in large part, to the internet, and that home buyer, sellers, and investors (as well as the real estate agents working with them) make decisions based, at least in part, to those things, it is imperative to know you have the right data and that it is the relevant data or information. Making a large financial decision, such as one related to buying or selling a house, on inaccurate, misunderstood or mispresented date or information, can literally cost you thousands of dollars. A report was released this past week from within the real estate industry that indicated there was an “inventory of homes for sale” of 3,272 in the City and County of St Louis combined and that this was “down 24.9% from 2018“. I saw many well-meaning real estate agents copy and paste the graphic or data on Facebook with messages that, if a buyer would create a little bit of a panic or concern on “missing out” and, if a seller, thinking competition is down so now is a good time to list your home and name your price. Continue reading Is The St Louis Housing Inventory Down 25 Percent Or Up 10 Percent? The Importance Of Understanding The Data. The real estate market in St Louis continues to do well although the home sales trend, as our chart below illustrates, has flatlined over the past year. On our chart, we plot the home sales for the prior 12 months for each month thereby making it easier to see trends in the marketplace. As you can see, over the past 5 years, the trend line consistently increased from about this time 5 years until about a year ago where it leveled off. This is not surprising as it is not realistic for our market in St Louis to be able to support that growth rate indefinitely. St Louis has had very little population growth over the past several years, and everyone only moves so often, so there is only so much sales growth we can sustain. St Louis Home Prices May Hit Resistance But So Far So Good.. There has been a lot of talk lately about a “price correction” coming in the housing market and I have discussed the possibility of it for the St Louis market as well. However, as the bottom chart shows, St Louis home prices during the past 5 years have been very consistent with an upward trend over time with the normal seasonal fluctuations along the way. Looking at the most recent couple of months as well as the past year as a whole doesn’t reveal any change in the trend at this point. Of course, this is something that can change quickly and I’ll be keeping an eye on it in the coming months but for now, things still look good for 2019 here in St Louis. Even though it’s that time of year when the real estate market in St Louis slows down, we are still in a seller’s market in most of the St Louis metro area based upon the supply of homes for sale. Historically, a 6-month supply of homes for sale would be considered a “balanced” market, not favoring sellers nor buyers. If the supply drops below 6 months, it favors sellers as there is less competition for them and above 6 months it favors buyers. Currently, 14 of the 17 counties that make up the St Louis MSA have a supply of homes for sale under 6 months. Two of the three counties that favor buyers, Macoupin and Calhoun, are in Illinois with St Francois County being the only Missouri County and it just barely made the list with a 6.26 month supply. 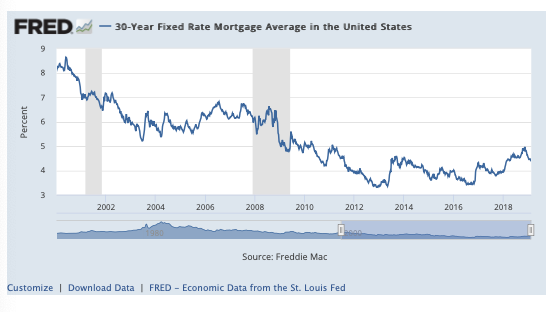 After mortgage interest rates on a 30-year fixed rate mortgage nearly hit 5 percent back in November, they have steadily declined and this past week fell to an average of 4.37% according to the Freddie Mac Primary Mortgage Market Survey. Last weeks 30-year fixed rate mortgage rate of 4.37% was the lowest average rate report by the survey since Feb 8, 2018, when the average rates were 4.32%. The outlook for mortgage interest rates looks promising as well with the most recent Fannie Mae Housing Forecast predicting the 30-year fixed rate will stay at 4.5% through the end of 2020. 30-Year Fixed Rate Mortgage Average In The U.S.
At the end of last month, Better Together, a not-for-profit group aimed at combining St Louis City and St Louis County into one big “Metro City”, released their plan for doing so. To say this is a hot topic among residents of those two areas would be an understatement. Proponents of the plan say it will make St Louis the 9th largest city in the U.S., will streamline government, dilute the city crime stats making them appear to be better and, in the end, lead to increased economic development and growth for the region. Opponents, such as the Municipal League of Metro St Louis argue that their (Better Together) plan is unconstitutional (hence why the Missouri Constitution must be changed to permit it) and that “the great divorce”, the label applied to when the city of St Louis separated from St Louis County back in 1876 was done using the Board of Freeholders, so if the two want to get back together, the same approach should be done to accomplish it (Board of Freeholders). Additionally, the opponents argue that allowing the entire state to decide the fate of the people of these two counties is wrong, that historic cities (such as Florissant and Kirkwood) will be disbanded and, in the end, the underlying problems that hinder growth here won’t’ really be addressed. The proceeding is, of course, my very brief synopsis of the two views as I see them so I would suggest you research the matter for yourself and have included some resources below to do just that. Report on Governance Issues in the Better Together Plan by E. Terrence (Terry) Jones, Professor Emeritus of Political Science and Public Policy Administration at the University of Missouri at St Louis. What the Better Together Plan means for St Louis home prices. 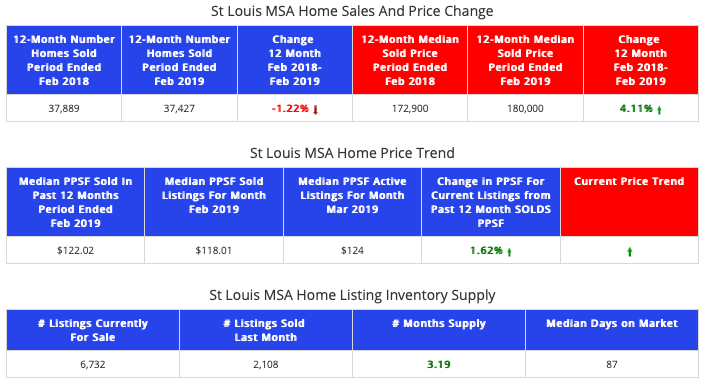 St Louis Real Estate Market Update VIDEO – February 2019 – Have Home Prices Risen Too Much? The St Louis real estate market is off to a little slower start this year and there are some indicators that we may be in for a little price correction in some areas. Find out more, as well as get information on some of St Louis’s best resources for home buyers and sellers in our just-released market update video. In our MORE, REALTORS, 5 Minute St Louis Real Estate Market Update video below, you can quickly and easily get the latest information on home prices, home sales, trends and more for the entire St Louis area! Many of the forecasts for home sales this year call for either a slight decline from last year or about the same as last year, in terms of home sales. I think the St Louis market will probably see about the same number of homes sold in 2019 as we did in 2018, it may just come with a little bit of a price adjustment. So, while I don’t like looking at home sales “year over year” for one month, I’m going to make the exception today and include that. As the first chart below shows, in January there were 1,282 homes sold in the St Louis 5-County core market (non-distressed home sales) which is down 5% from January 2018 when there were 1,352 homes sold but is up nearly 2% from January 2017 when there were 1,259 homes sold. 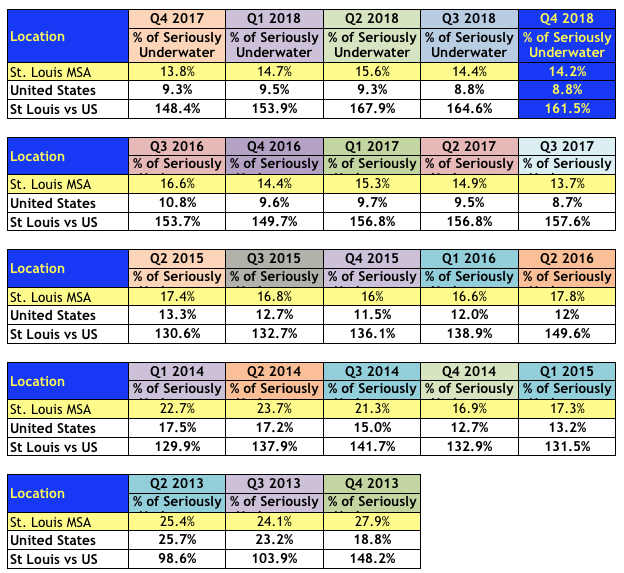 During the fourth quarter of 2018, 14.2% of the homeowners in St Louis with a mortgage, were underwater on their mortgage, meaning they were in a negative-equity postion, according to data just released by ATTOM Data Research. As the table below shows, this is the lowest rate since the 4th quarter of 2017 when the St Louis undertwater homeowner rate was at 13.8%. On a national level, just 8.8% of homeowners with a mortgage are underwater which puts the St Louis rate at 161.5% of the US rate. Missourians Can Now Get Tax Deduction For A Home Down Payment! At the start of this year, the Missouri First-Time Homebuyer Savings Account program went info effect making it easier for first-time home buyers to prepare to buy a home. This program provides for tax-deductible savings acounts for first-time homebuyers making it easier for homebuyers to save for a down payment by giving them a tax decution for the amount they save. People wanting to save for a home can contribute up to $3,200 per year for married couples and $1,600 for all others. Homebuyers participating in this program will be entitled to a tax deduction on their Missouri Income tax return equal to 50% of the amount they contributed to their first-time homebuyer savings account. The list of the 10 St Louis cities where homes sold for the highest average price last year shown below reveals that the little city of Huntleigh, consisting of a land mass of just 1 square mile but home to some of the wealthiest people in St Louis, is where homes sold for the highest average price during 2018. Granted, there were only two homes sold in Huntleigh during the past year (which were in the MLS) but with prices of $2.785 Million and $9.8 Million (for an average of $6,292,500) it catapulted Huntleigh to the top of the list of the most expensive average home sales price for St Louis. Coming in a distant second to Huntleigh is Ladue where the average sales price was $1.104 Million. See the most expensive homes sold in St Louis in the past year here.